Crafts! Wonderful, creative, exciting, engaging, inspirational, messy, humorous, wonderful, wonderful crafts! Your children love to do crafts at home, at school, at daycare, at their grandparents’, at the cottage, in the car… everywhere. Since crafts are a safe, healthy way to spend their time, you want to keep them supplied with the items they need to make the crafts they want, but running around to several different stores to buying popsicle sticks, googly eyes, pipe cleaners, and everything else is exhausting you. Luckily, there are several companies that make all-in-one art and crafts kits for kids, which makes your life a heck of a lot easier. Check out these super cool craft kits that your kids can enjoy at home, at school, at grandma’s… you get the idea. Are Arts and Crafts Really Important? Paper bag puppets are a classic craft that kids have been making for decades – maybe even longer (when exactly DID the paper bag come into existence?). 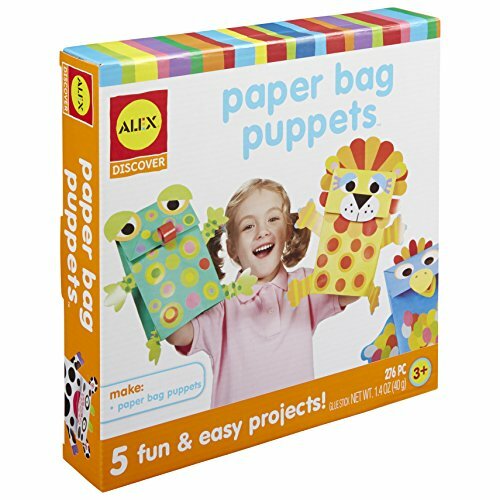 Rather than search from basement to attic for all the supplies required to make the puppets, using this nifty activity kit is a great alternative. It contains five different colored bags, 270 bright stickers and paper shapes, a glue stick, and easy-to-follow instructions, although we’re pretty sure you won’t need those. If you or the kids do use the instructions, though, you’ll end up with a personalized lion, frog, cow, chicken, and elephant. The joy of creativity is that no two puppets will ever be the same! Check this out: James gives this kit a thumbs-up! How can you argue with that? The supplies for making each animal puppet is wrapped in its own individual bag which makes it easy for kids to choose one and work on it themselves. It also means that the kids can start the craft and then put it away to finish later if necessary. And since the only non-paper supply needed is the glue stick, it’s both simple and safe for your little ones to enjoy this activity on their own. If your youngsters are under the age of three, however, or if they have developed an unfortunate taste for glue, we don’t recommend this as an unsupervised craft. 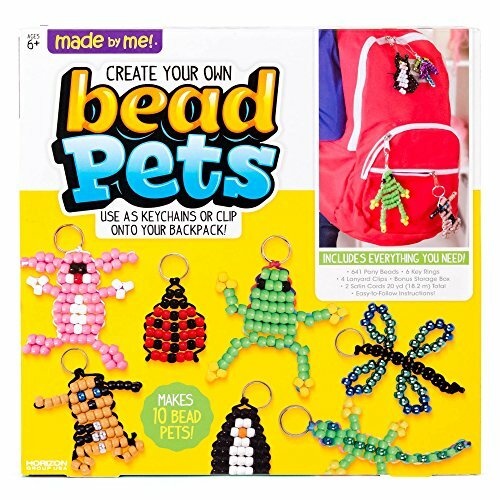 This craft kit comes with a fantastic container box for keeping all the small beads and supplies in, which is particularly convenient as it’s unlikely you or the kids will make all ten bead pets at once. The set comes with 241 beads, 6 key rings, 4 lanyard clips, 2 satin cords (20 yards in total), the storage box, and an instruction sheet. The instructions are not always helpful and extra assistance may be required, whether it be via YouTube or from a friend or family member who’s done it before. According to the teenagers in this video, this may not be a great craft for small kids, or at least some of the animals might be more difficult than others for younger ones to create. This is a great gender unspecific craft kit as it has cute “girly” creatures like ladybugs and bunnies, but also has “boyish” ones like frogs and lizards. A project like this is a good way to encourage kids to use their problems solving skills, particularly if they find the directions hard to understand. It also strengthens fine motor skills in younger crafters and enhances concentration since threading the beads requires particular focus. The resulting keychain animals are both cute and functional! Your little ones can proudly display their artwork by attaching the keychains to their backpacks, coats, etc., or by using the lanyard clips and wearing as a necklace. They also make cute gifts for parents, grandparents, or friends and the kids can be proud of gifting such personal, handmade treasures. The Rainbow Loom craze has consumed kids for the last few years and it doesn’t seem to be fading out of the limelight quite yet! The design is brilliant: you use a crochet-like hook to wrap small colorful rubber bands around a plastic pegboard, weaving it all together. The braid-like weave forms a long strand that can be held together with special clips to form bracelets, necklaces, charms, headbands, key chain charms, even a scarf! And that’s only the tip of the iceberg. The internet is FULL of tutorials for making the coolest and wackiest creations with a Rainbow Loom! One of the best things about the Rainbow Loom is that it can provide endless hours of entertainment. It’s not just a kit with one craft to complete, it offers a never-ending list of possible projects to do, which means it’s a fantastic investment in entertainment for kids. Refill packs of elastics come in every color you can imagine and are ridiculously cheap ($3.83 from Amazon! ), so keeping the kids occupied is easy and inexpensive. Not surprisingly, it seems to be mostly girls who love the Rainbow Loom, but boys can definitely enjoy it as well. If you introduce them to tutorials like these, making Super Mario figures or Minecraft Skeletons will quickly become your little guy’s favorite pastime. 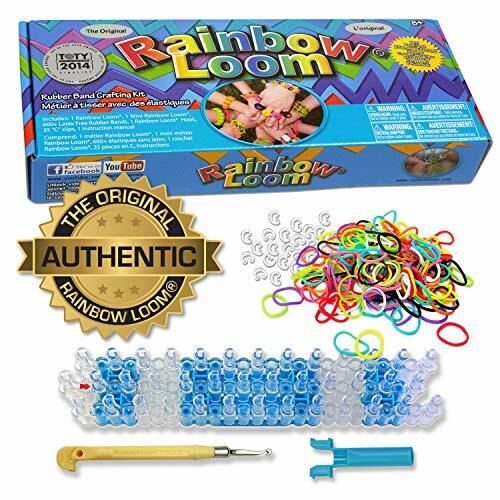 A word of warning, though: be vigilant about cleanup time or you might find yourself wishing you’d never heard of the Rainbow Loom… you’ll be finding those tiny elastics EVERYWHERE if you’re not careful! 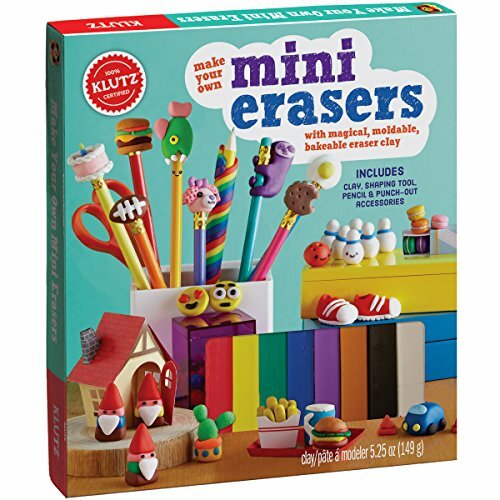 This isn’t just a craft kit, it’s a 48-page book as well as materials for kids to create some super cute homemade erasers. A book AND a craft? Win-win! On the materials side, the kit includes clay in 8 different colors (enough for 25 erasers), 1 pencil, and a clay-shaping tool. It also comes with 2 sheets of paper crafts that can be folded and used as holders for the different erasers, including a tray for the sushi erasers and a shoebox for the sneaker erasers. The book is full of detailed, step-by-step instructions for how to create each individual eraser. Some of the individual designs include emojis, a pizza slice, a koala bear, a mustache, and even a rocket ship. Each page in the book has the necessary clay colors noted at the top and then lists numbered steps to tell you what techniques and methods are needed to form the eraser. Although there are a few materials not provided in this kit, like a non-stick work surface and a foil-lined baking sheet, it’s nearly all-inclusive (you wouldn’t actually expect a craft to come with a baking sheet, would you). You also have to be careful to store the clay properly if you expect it to last – the kit doesn’t come with the necessary zipper bags or airtight containers. The book is of such good quality that it can be kept even after all the clay is gone and you can then buy more clay and make more erasers – just because the included clay is used up doesn’t mean the fun is finished! There really is something for everyone in this kit, and not only are all the eraser designs super cute, they actually make usable products! Great for both boys and girls – and adults too! If you have a creative child who is constantly coming up with craft ideas and creations, he or she is going to need a quality set of supplies in order to pursue their passions. Crayola is a giant in the arts and crafts industry and this kit is no exception to the rule of their excellent products. Contained within this art case is a set of 8 glitter crayons, 5 tubes of glitter glue, 5 pieces of glittery chalk, 1 glitter marker, 1 sheet of stickers to color, and 30 sheets of colored construction paper. The case itself is even helpful as it offers a space to contain all of the supplies so they’re not floating around your home. Although this set doesn’t come with instructions for any specific artwork or crafts, all of these supplies will allow your kids’ imaginations to run wild and come up with their own creative ideas. ed here to finish their art projects, it is surprising that scissors and glue, or some other type of adhesive, aren’t part of this kit. Such items are available from Crayola for decent prices, but it would be more convenient if they were already included. 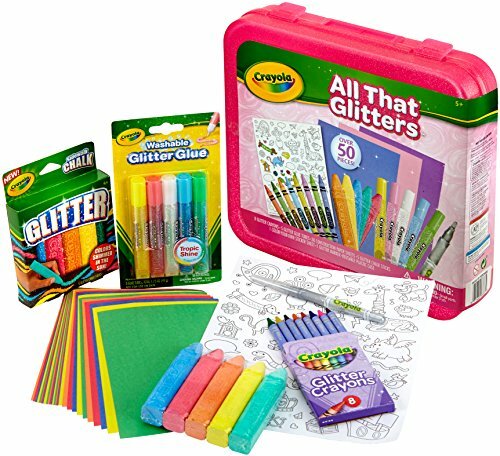 This particular art set is overtly feminine with its emphasis on sparkles, but there are other, similar Crayola products available that are less gender specific – like this one. We all know that kids love to work with arts and crafts. But do we all take the time to participate in the artistic process with them? And are arts and crafts really that important for kids anyway, or is it just something they can do to pass the time? There has been a lot of discussion about whether or not art is something that kids should be taught at school, or whether it’s more important to have them focus on core subjects like math and science. It’s not a simple either-or type of decision, though. Artwork and creativity play vital roles in shaping the minds of our young children, the same minds that are preparing to engage in the logical areas of math and science. As this article from PBS says, “simple creative activities are some of the building blocks of child development.” Older kids need to stretch their imaginations too, so they can learn to access their inventive sides, to appreciate the cultural diversity of our country, etc. This video from ORCA (Ocean Research & Conservation Association) does a powerful job of explaining “Why Art Matters.” It provides great visuals to drive home how effective different types of artwork can be in getting messages across, versus using plain facts. The narrator says that “Art provides the means of seeing the world differently and as such it serves to not only reflect changing human perspectives but to inspire them.” If you think about this in relation to our kids, it seems like it’s one of our highest duties to provide them with the means to express themselves through artwork! Looking at it from a more lighthearted angle, the simple fact is that children just love arts and crafts! Especially with toddlers and preschoolers, artwork is a way for them to enjoy how bright the colors are, how paint feels in their hands and fingers, or how the glitter dances in the light. According to this piece from Parents magazine, little kids really don’t care about what they’re making, they care more about the experience. As kids get older, they care more about the artistic process and how they feel when they are creating. This short video, “Why Kids Love Art,” uses a series of clips from interviews with elementary-aged children to explain why they love their art classes in school. One child says that “If you make mistakes, you can turn them into something great.” Another student says that she feels like she’s in a different world when she’s creating art and that “When I’m in that different world I feel like I could do anything.” When a child feels this passionate and empowered by working with art supplies in school, imagine how they feel when they’re encouraged to do arts and crafts with family members at home! All of this information tells us that allowing kids to experience arts and crafts is extremely important. So how can you go about encouraging their artistic expression at home? Definitely supply them with craft implements or a pencil case, just having these supplies at home and accessible for your kids at any time makes a big difference for them. Be prepared for them to make a mess, only offer advice or instruction if they ask for it, and engage in their artwork as much as you can without suggesting any changes are the tips Parents magazine gives. Keeping these notes in mind and acting accordingly will help to encourage your children to explore and express themselves through painting, drawing, coloring, sculpting, or whatever other forms of artwork they choose. Don’t just encourage them to create, though. Engage in crafts with them! There are a few things you can do to reassure your kids of your support or to inspire them to further explore their passions than by participating in these passions with them. It doesn’t even have to be that they have an overt enthusiasm for artwork. You can provide them with creative opportunities that coincide with other interests too. This is where craft kits can come in particularly handy. If you notice that your daughter has an interest in jewelry, giving her a jewelry-making kit that you and she can work on together will both encourage her interests and allow you both to spend quality time together. Or maybe you have seen that your son often plays with his race car tracks for hours on end, you might think to get him a kit where the two of you can build and paint monster trucks will give him hours of fun even after the craft is completed. Finding ways to support your children’s interests and combining it with artistic expression and quality time with family may not be as difficult as you think. The real purpose of crafts is to provide a form of guided artwork. This kind of guided experience can inspire kids to work on further projects on their own, independently. That jewelry-making kit you enjoyed with your daughter might inspire her to keep working on other forms of jewelry making, like papier-mâché beads for bracelets or repurposing small household items into pendants. Your son’s handmade and hand-painted monster truck could easily spur him on to explore other forms of woodworking or painting, like making small pieces or furniture or painting murals. Really, there’s no end to the avenues or possibilities that can be opened for your children when you expose them to arts and crafts. They may or may not already experience these creative avenues in school, but allowing them to connect with you or other family members while also enjoying artistic activities in the comfort of their own home offers invaluable validation and support. Yes, Melissa and Doug are a real couple! They were business partners first, in 1988, and became partners in marriage a few years later. They started out making wooden puzzles and now have a variety of products that enables them to compete with giants in the industry like Mattel and Lego. Klutz is a subsidiary of Scholastic Inc, which is a huge name in the educational publishing sector. Founded in 1977, Klutz creates books, activities, and educational material that “stimulate creativity and critical thinking in kids of all ages.” You can even find the “100% Klutz Certified” stamp of approval on Lego products. Although now a subsidiary of Hallmark Cards, Crayola is possibly the most recognized name in the arts and crafts industry. Having been around since 1885, Crayola has grown into an internationally recognized brand that produces numerous products, including their iconic crayons. In fact, the company now produces roughly 12 million crayons every day – which no doubt contributes to its $250 million annual revenue. What art and craft supplies can I keep at home to supplement the craft kits? Some basic supplies to keep at home are construction paper, pens and pencils, crayons/markers/colored pencils (or all of them! ), scissors, caked watercolor paints, paintbrushes, plain craft paper, and stickers. These are all readily available at most box stores, even some grocery or drug stores, at very little cost and can definitely be ordered online or found at specialty art stores for reasonable prices. How can I encourage my kids to do craft projects with me? The best way to encourage this is to take not of your kids’ interests, maybe even which television shows or movies they like, and pick craft kits that coincide with these interests. For instance, if your son loves playing Minecraft, you could try this kit and make pixel-style crafts with him. Or if your daughter loves all the Disney princesses, constructing and painting this magic wand could be fun. Where is the best place to do crafts with my kids? Crafts can be done anywhere! That is, anywhere where you don’t mind cleaning up the mess that is guaranteed to follow the crafting. The kitchen table is a great place to start as it’s often the hub of the family’s activities anyway, and a large, flat surface is necessary for most projects. If you don’t have a large enough table, the floor works just as well! If you have the space in your home for a dedicated craft room, the creative possibilities are endless. Wherever you choose to create with your young ones, it’s always advisable to cover your work surface in a protective covering, just in case. What skills do kids learn from doing arts and crafts? According to Highlights magazine, while your kids are enjoying being creative they’re also learning several important life skills. Perhaps the most basic skill they learn is how to follow directions – this is true even for older children. Kids’ fine motor skills can improve through drawing, picking up small materials, cutting, etc. Patience is most definitely key when crafting and your little ones will definitely need to put it into practice. Certain problem-solving skills are also necessary when attempting crafts, especially when they’re not using an all-inclusive kit. Arts and crafts are also great opportunities for young ones to practice concentration and to focus on the task at hand. All of these contribute to the development of healthy minds and bodies. When is the best age to give craft kits to kids? Kids of all ages enjoy doing crafts! Toddlers enjoy painting as they love the feel of the paint on their fingers. Preschool-age children especially enjoy crafts that involve coloring or gluing things, like pictures made with painted macaroni or animals made out of toilet paper rolls they’ve colored. Kids in elementary school like to create something new out of something old, like birdhouses out of milk cartons or airplanes from popsicle sticks and clothespins. Preteens enjoy crafting too and they enjoy it when the project is a bit more involved, like needlepoint, weaving, painting coffee mugs or drinking glasses, or creating unique garland strands. Even teenagers like doing crafts and they are often mature enough to tackle some very complicated projects, like jewelry making, using photos to create drink coasters, or even learning how to do intricate fingernail art. How much do craft kits for kids cost? Craft kits are usually quite inexpensive, but it really depends on the type of activity involved. For instance, a coloring book and crayons can cost as little as $1 at your local dollar store but an all-inclusive jewelry making kit can cost around $20 or $25. Whatever types of crafts your kids are into, there may be cheap kits available as well as more pricey options, but the key is to buy kits that include quality materials that won’t break easily. The better the quality of the materials, the more you will have to pay for the kit. As we already said, you know that your kids love crafts and you know that it’s a healthy use of their time. And now you know just how good it is for your little ones to have an outlet for their artistic sensibilities, it’s time to make some family memories. It’s time to order a race car making kit, a paint-by-number set, or maybe a dream catcher kit and let their imaginations get fired up. It’s time to join them and nurture these hands-on activities that are good for their health and hearts. It’s time to enjoy watching the joy on their faces!